Tea has been consumed in China for more than 3,000 years, and it is only in this country that we find such a rich variety. It produces all colours of tea: white, green, blue-green, yellow, black and dark. In China we find a unique culture of terroir: one village might have been following a very specific tradition of tea shaping for centuries, while in the next village the leaves could be processed in a completely different way. Nowhere else in the world do we find such a variety of practices. This photo shows my 2017 selection of “new-season” Chinese green teas, some of which were harvested before the Qingming festival. 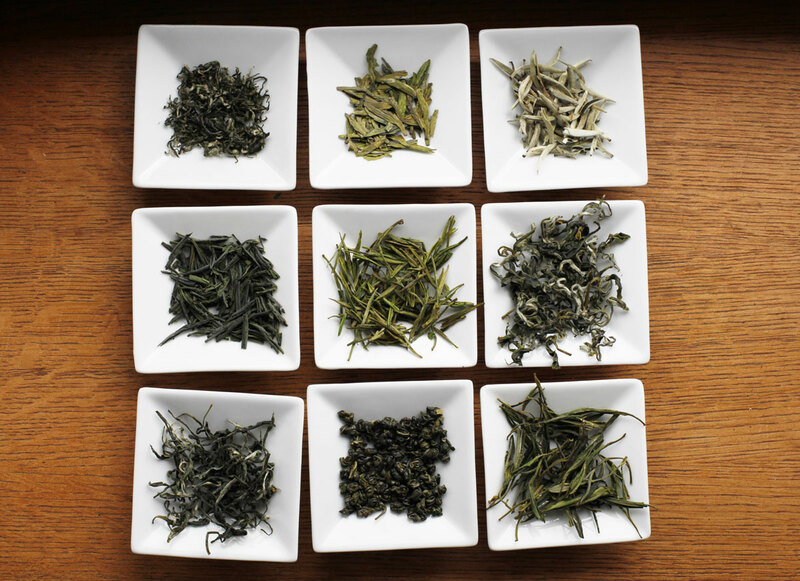 From left to right: Pre Qing Ming Bi Luo Chun, Pre Qing Ming Long Jing, Pre Qing Ming Bourgeons de Jade, Pre Qing Ming Lu An Gua Pian, Pre Qing Ming Anji Bai Cha, Bai Mao Hou, Mao Feng Premium, Yong Xi Huo Qing, Huang Shan Mao Feng. It goes without saying that just as the size, shape and colour of the leaves differ so much, the tasting experience is equally varied among these premium teas.